All furniture shoppers are not created equal. Each shopper is looking for a different product to fit their needs, and each has their own priorities of features the product must have. Armed with an extensive catalog offering, furniture retailers have the merchandising power to provide the perfect piece for everyone – but having the product listed online is only one part of the equation. Online shoppers need the ability to find the products they’re interested in, which can be an impossible task without the proper tools. Keep reading to learn how Blueport Commerce provides a better shopping experience for furniture buyers, while offering a continuous stream of innovation to our retailer partners. When a customer is in store, they can rely on a knowledgeable salesperson to point them in the right direction. Online, an ecommerce platform must provide easy-to-use filtering tools that allow shoppers to narrow down a product list to ones that are relevant to them. A faceted search consists of filtering and sorting options that empower the user to narrow down a list of items and reorder it in a way that is uniquely tailored to them. Filters are based off of product features and attributes, such as style, color, shape, and many more. Often times, furniture shoppers have some idea of the type of item they are looking for. Certain features, such as size or price, may be non-negotiable. A robust and faceted search tool empowers shoppers to customize their shopping experience, leading to less abandonment, more product views and ultimately conversions. Here at Blueport, our teams spend time gathering user feedback and performing extensive site testing to isolate potential pain points for shoppers. Our findings revealed that the key factor in the success of the search page experience is that it’s smooth, easy to use, and fast – as easy as walking into a store, telling a salesperson your needs, and having them guide you to your options. Based on the feedback Blueport gathered, we set out to enhance the search filter by updating the design and improving both the mobile experience and speed of applying filters. Shoppers on the Blueport platform are now able to easily select more than one filtering option without having to wait for a page reload or having to scroll back down the page each time to view the results. Additionally, collapsing the filtering options into expandable “drawers” allows users to easily see all the ways they can filter their search, without having to scroll too far down the page. 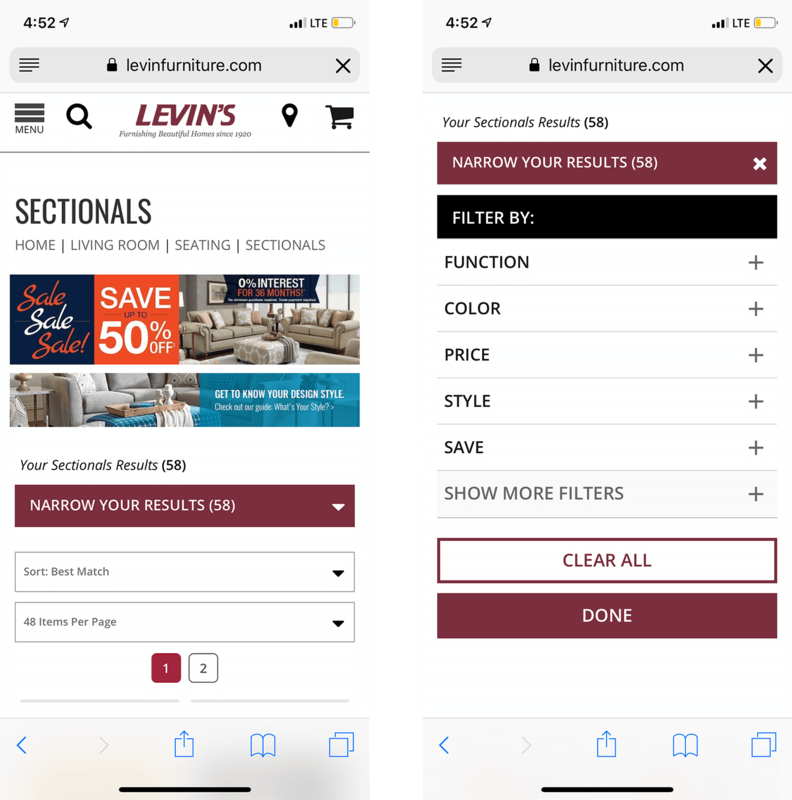 A key mobile improvement now allows shoppers to select a mobile-friendly filtering experience, which results in a screen takeover of the filtering options, making it easier to see and interact with the filters, while the products update in the background. 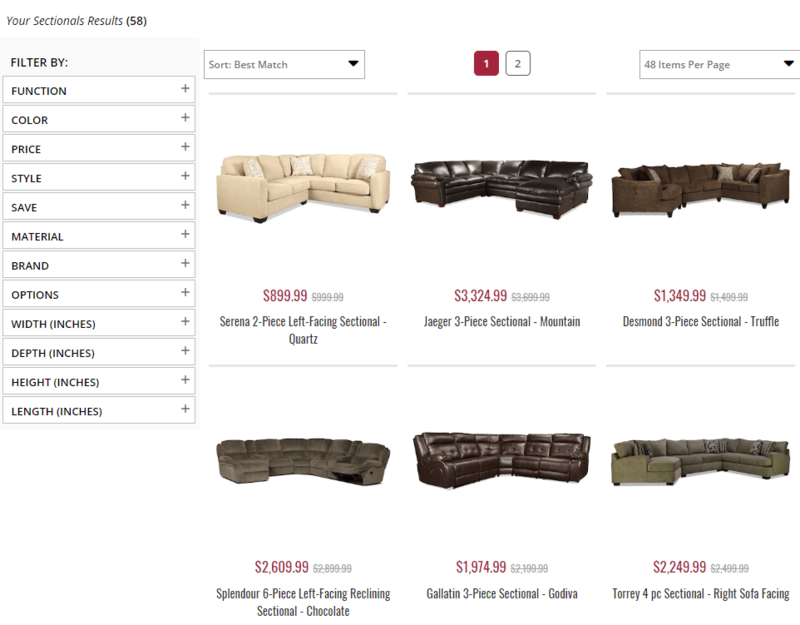 Blueport’s improved search experience is already producing the right results. Key metrics such as product views per visit, average time on search pages, and exit rate on search pages have improved since the release of the new filtering experience. On desktop devices, Blueport observed a 5% increase in product views compared to the pre-release time period. Average time on search page also increased across all devices by 3% versus pre-release, and the exit rate off of search pages decreased by 2%. There were also modest improvements in other key ecommerce metrics, such as cart additions, which supports the hypothesis that reducing friction in the search and browse experiences leads to more customers finding the products they’re looking for and ultimately converting. Providing users with optimal ecommerce tools like faceted search can greatly improve the online shopping experience, especially on mobile where usage is always growing. By consistently taking user feedback into consideration, and keeping up with industry and ecommerce trends, we at Blueport can ensure a continually improving omnichannel experience that is fine-tuned for the needs of furniture shoppers. Solving the unique challenges of selling big-ticket items online, Blueport Commerce offers a comprehensive suite of vertically-focused features that are included “out of the box” – a robust ecommerce filtering system is just one of the many features a retailer can expect to see on the Blueport Commerce platform. Interested in learning more about the Blueport platform? Contact us today – we’d love to hear from you.